Corey Brown, left, shot and killed Nicoleia Taylor Tuesday morning, cops said. CLINTON HILL — A woman was shot and killed near the Pratt Institute Tuesday after she was caught in crossfire between two groups of shooters, cops and witnesses said. Nicoleia Taylor, 24, and another victim, were shot in the courtyard of Lafayette Gardens Houses at Franklin and DeKalb avenues about 11:30 a.m., police said. Both victims were rushed to Brooklyn Hospital, where Taylor was pronounced dead from a gunshot wound to the chest, police said. The condition of the second victim was not immediately available. 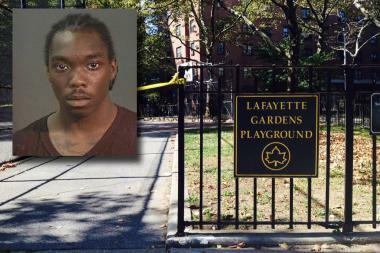 The shooter, 21-year-old Corey Brown, fled the scene, cops said. He has five prior arrests including menacing with a weapon, criminal tresspassing, two robberies and reckless endangerment, officials said. An aunt said Taylor was a nurse and mother of two who worked with disabled children. "She was a very good girl," said the tear-stricken aunt, Gayle Thomas. "She had nothing to do with the shooting." Robert Page, 51, who lives in the complex, said Taylor was caught in a hail of bullets coming from two groups, one shooting from the DeKalb Avenue side of the courtyard, and the other shooting from the Franklin Avenue side. Other witnesses said they heard between four and five shots. Cops concurred that Taylor was not the intended target, but could not confirm that there were two groups of shooters.